Continuing my early impressions of my new Vye S37, I’m going to spend some time here going over my “first impression” reactions to the overall aesthetics and design of the system. 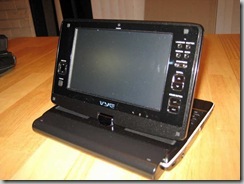 As a reminder, I have previously been using a TabletKiosk eo v7110 UMPC for close to 2 years, so it will obviously serve as a key point of comparison. 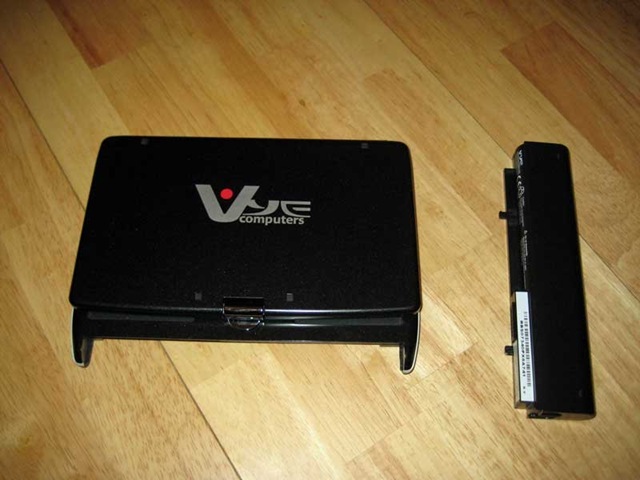 Even having used a different UMPC for quite a while, I still couldn’t help but react a bit to how small the Vye is. Even when the FedEx delivery man handed me the package, I was struck by how small it was. I suspect that if I had told the delivery man that the box contained a full-featured Windows Vista laptop computer, he probably wouldn’t have believed me. Since it is a convertible rather than a slate, the Vye is definitely a bit bulkier than the eo was, but it actually gives more of an impression of smallness since the form factor is one that we are generally used to seeing in devices that are twice as big or larger. 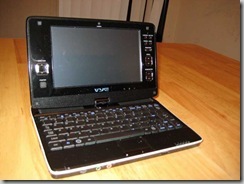 The eo looks a lot like an enlarged iPod while the Vye looks much more like a laptop that was hit by a shrinking ray. 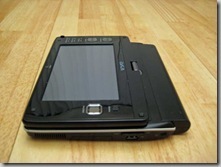 The exterior of the unit is rather sleek and attractive, with the glossy black case and nicely curved edges. The surface is something of a fingerprint magnet, though, which means that they likely should have included a microfiber cloth (fortunately, I already have several from previous devices). 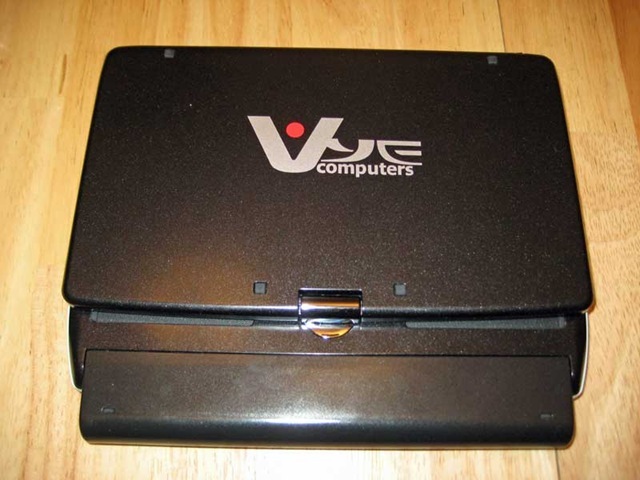 My only major complaint about the exterior appearance is that I definitely could have done without the giant “Vye Computers” logo on the back of the screen. I would have vastly preferred a plain exterior and I really think the tastefully subtle Vye logo under the screen should have been sufficient branding. Even with the giant logo, the etched on branding is definitely more tasteful than the logo stickers that TabletKiosk stuck on the eo. The keyboard does make the unit somewhat thicker and a bit heavier than the eo was, although honestly not by that much. The included 6-cell battery is fairly large (about the same size as the eo extended battery) and extends out quite a bit behind the screen. This makes for a fair amount of dead space below the screen when it is rotated around to slate mode, making it a bit more awkward to use. I’ve been pretty impressed with the battery life so far (the extended battery seems to make it to the 4-5 hour range), so I have placed an order for the optional 3-cell battery, figuring that the smaller battery should be sufficient for most meetings, lunch hour use, and even much of my around the house use. The 6-cell battery will, of course, be my first choice when traveling or in other scenarios where I will be away from electrical power for a longer period of time. 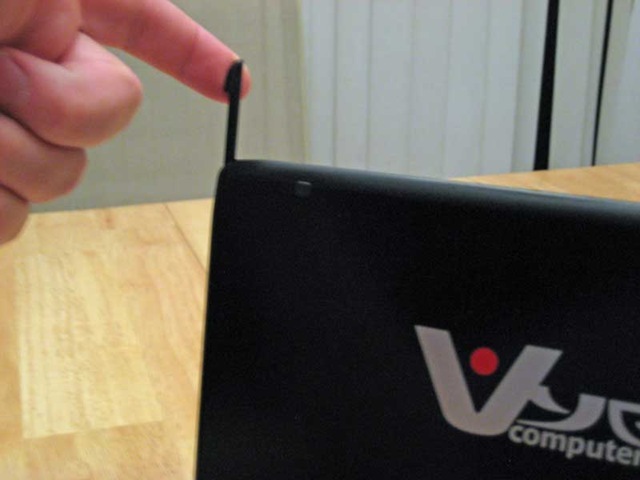 The Vye does include a small, plastic stylus that is well hidden in a compartment on the upper right side of the screen. In fact, it is so well hidden that I had to search for it and even initially thought there might not be one at all. 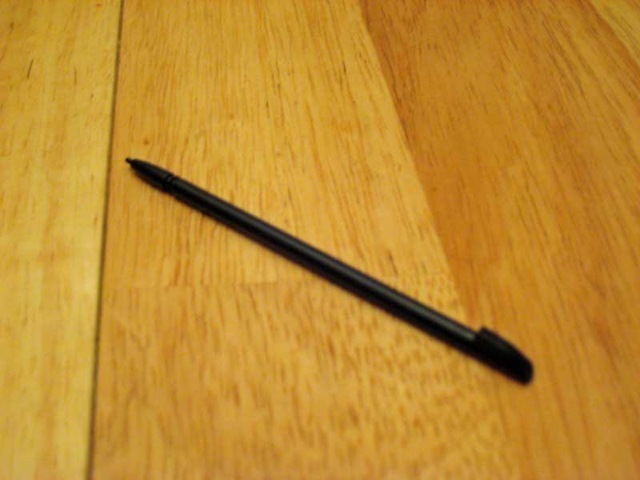 The stylus is very small and pretty flimsy and isn’t going to be useful for anything other than really quick tasks. I definitely will need a larger stylus/pen for any notetaking or other extensive tablet use. 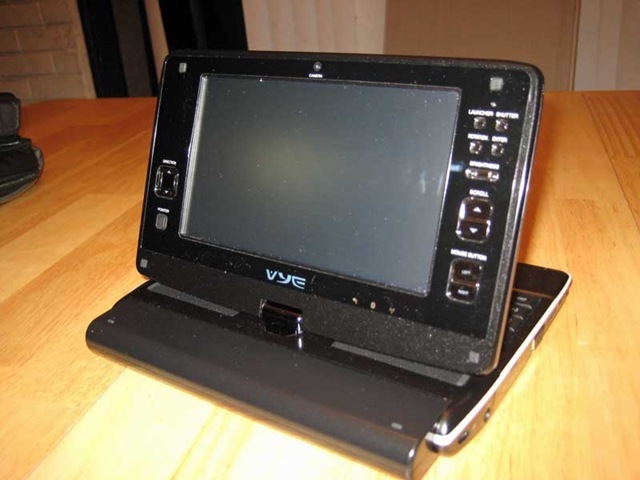 The set of buttons and controls alongside the screen on the Vye are pretty comparable to those on the eo, although often in different positions. I am especially glad that the device does have a trackpoint and mouse buttons next to the screen, although I’m not quite as pleased with the placement. The trackpoint is on the lower left side of the screen while the mouse buttons are on the lower right. Inexplicably, the “left” and “right” button are stacked vertically instead of being next to one another. I’m finding that a bit hard to get used to, although I haven’t really used the device all that much in slate mode yet. 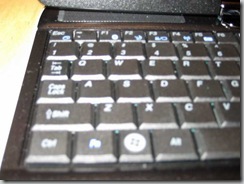 The screen bevel also includes a square 4-way rocker that acts as the four arrow keys. It is a comfortable design, although I miss the placement of the enter button in the center as found on the eo. There is a somewhat less-convenient enter button on the upper right of the screen along with “launcher”, “shutter”, and “rotation” buttons. 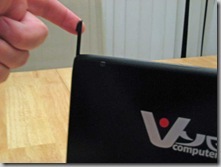 The first two in that group are used to control the built-in webcam located above the screen. Below those buttons is a horizontal rocker button for adjusting brightness and a pair of large buttons for scrolling the page up and down. Of course, most of these controls can also be accessed via the keyboard and touchpad, so they are mainly needed when using the unit in slate mode. For the most part, the ports are well positioned and pretty appropriate for this kind of unit. It has two USB 2.0 ports, one each on the left and right side. On the right side, there are also SD and Compact Flash readers. 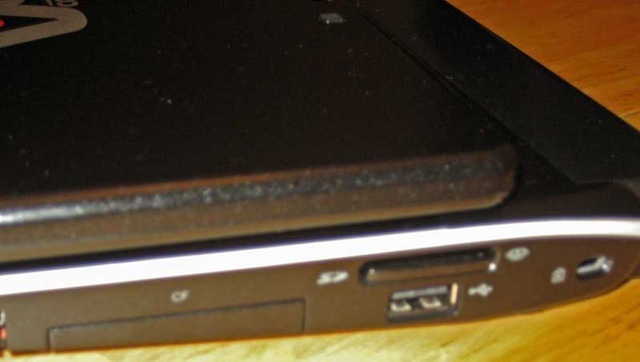 The USB slot on the left side is in a small covered compartment that also includes an Ethernet port. The cover is a bit flimsy, though, and I’m not really sure how well it will hold up. 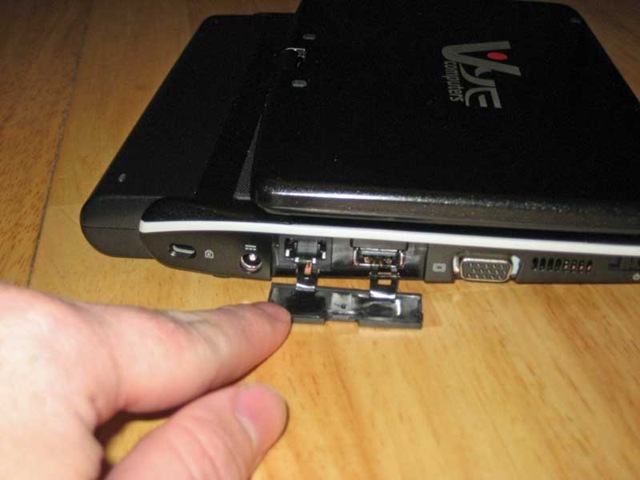 There is also a VGA port on the left side, which I actually would have preferred being under the cover instead of the USB, which will likely need to be accessed much more often. The power switch is towards the front of the left side. 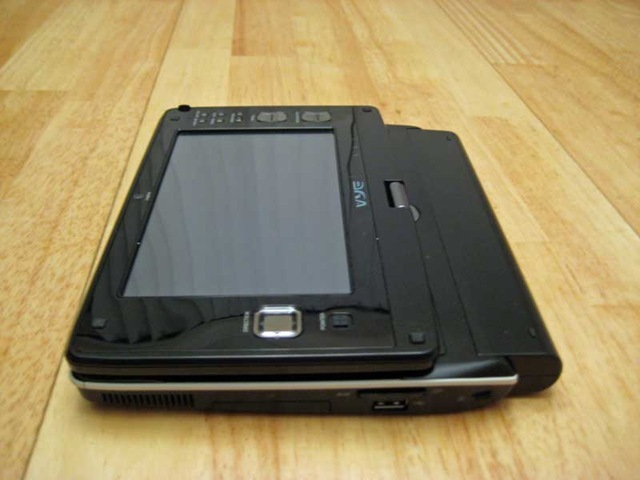 It unfortunately lacks the “lock” mode that was available on the eo and was useful for transporting the unit short distances without having to worry about accidentally hitting buttons or the touch screen. One design choice that I really like a lot is the inclusion of two Kensington lock ports, located towards the back of the unit on both the left and right sides. I do use a Kensington lock to secure my UMPC while at work and the location on the bottom of the eo was incredibly inconvenient. 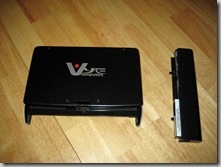 With the Vye, I can very easily leave it locked until I next need to transport it. The lock never gets in the way at all. The selection of ports and buttons are rounded out by headphone and microphone jacks, a volume control, and an on-off switch for the wireless along the front edge. I initially wasn’t sure that the placement of the headphone jack would work all that well, but after a few days of use and a bit more thought it seems fairly unlikely that I would have the unit in slate mode for media use. With the unit opened, the headphone jack is pretty well-positioned. I can’t really discuss the overall design and aesthetics of the Vye without writing about the keyboard. My reaction so far is that this keyboard is probably as good as you are going to get for a unit this size. 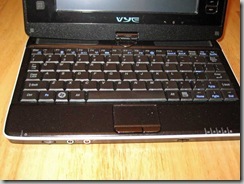 Yes, the keys are certainly a bit cramped and the layout has a few compromises, but it is an extremely usable keyboard. I do wish that the keyboard had a backlight, or at least was designed with a bit more contrast between the keys and the key labels, as it is very difficult to see the keys in rooms with low illumination. The small, closely-spaced keyboard does make it helpful to be able to occasionally look at the keys, even for a touch typist. I’m a fairly fast touch typist and I have found that I am able to come pretty close to my normal speed and approach to typing on the Vye. It has taken a bit of practice to start to feel comfortable with it, but it really hasn’t required as much acclimation as I thought it might. The biggest problem that I’ve had has been a tendency to sometimes hit the ctrl key instead of the shift key, which can sometimes have some slightly unfortunate results. I have found that this problem has very quickly lessened with practice. 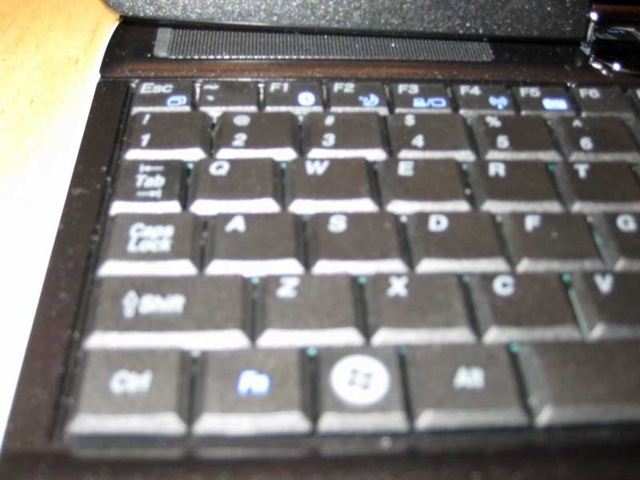 The other aspect of the keyboard that I have found a bit of a frequent cause of errors is the fact that the number keys are shifted one position to the left of where they normally are placed. This is because the escape key was moved to the function key row above the number keys. Because of this, I have pretty regularly found myself off by one when typing numbers. I would imagine I will also get used to this soon. I honestly wasn’t sure how useful the small keyboard would really be for extended use and, thus far, have been keeping my Think Outside Stowaway keyboard in my gadget bag as a back-up. I have been quite pleased with the Vye keyboard, though, and I suspect I will soon decide that carrying around the folding keyboard is no longer needed. I have actually written this entire blog entry on the Vye using the built-in keyboard without much difficulty. The first half of it was written during my lunch hour while sitting at a table at a favorite pizza place. The second half was written while stretched out on my couch at home with the Vye comfortably placed on my lap. I am going to hold off on actually publishing the post until tomorrow as I have some photos that I would like to add. I will most likely work on those during my lunch hour tomorrow, giving Photoshop Elements a bit of a work out on the Vye. This really is ultra-mobile computing at its best! This entry was posted on Wednesday, January 16th, 2008 at 2:21 pm	and is filed under Hardware, Reviews, UMPC, Vye. You can follow any responses to this entry through the RSS 2.0 feed. You can leave a response, or trackback from your own site. I bought my Vye a couple of months ago. The first thing upgraded was the memory from 1gig to 2gig. The upgrade was simple, pop off the back cover and insert the memory. 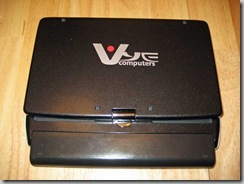 The system came with Vista. The second upgrade was to insert a memory card and take advantage of Vista’s ready boost (4gig card). Boot up is quick. Most of the 120gig hard drive stores music (80gig) and I use Mixmeister Fusion to play my dance music. Great product! I also have a OQO2 and Tabletkiosk. I use the the Vye everyday.